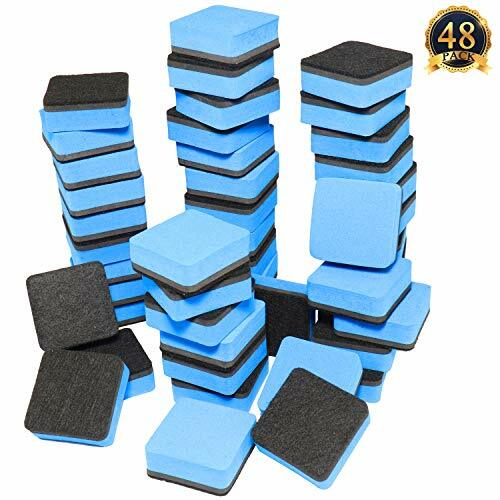 Lightweight and soft erasers,can be applied in classrooms as daily necessary.Erasers with soft magnetic can stick to metal surfaces like metal whiteboard,chalkboard and so on. To clean the whiteboard easily and effectively,you could press the erasers a little bit harder. Whiteboard eraser:package comes with 48 magnetic whiteboard erasers,suitable for children and adults. Strong magnetic,perfect for sticking to the whiteboard or other magnetic surface, make it not easy to lose. Size:1.97"x 1.97"x 0.79"(5x 5x 2 cm) color:yellow,they will appeal your kids. Bulk supply:keep these erasers at home or at the office where planning and decision making takes place.Keep them near boardrooms for meetings or presentations.They're also a must-have school supply. Quick to clean.Just swipe the eraser with a little pressure to clean your whiteboard. If you have any questions about this product by SUBANG, contact us by completing and submitting the form below. If you are looking for a specif part number, please include it with your message.